A new challenge starts today at Crafty Boots Challenges, for the next two weeks the theme is 'Things with Wings'. So many choices amongst my stamps, where to start. I decided to start with a stamp I bought for a previous challenge but did not have the time to use. This stamp came from Saturated Canary and is called 'Princess and A Frog'. 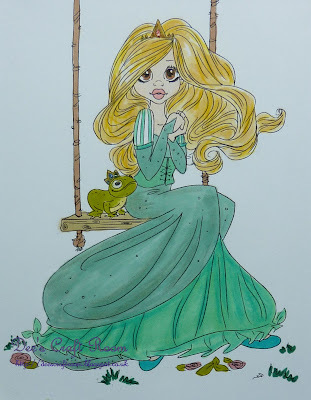 I thought about airbrushing the frog from the swing but, if I did this, I would not be able to use the cute sentiment. 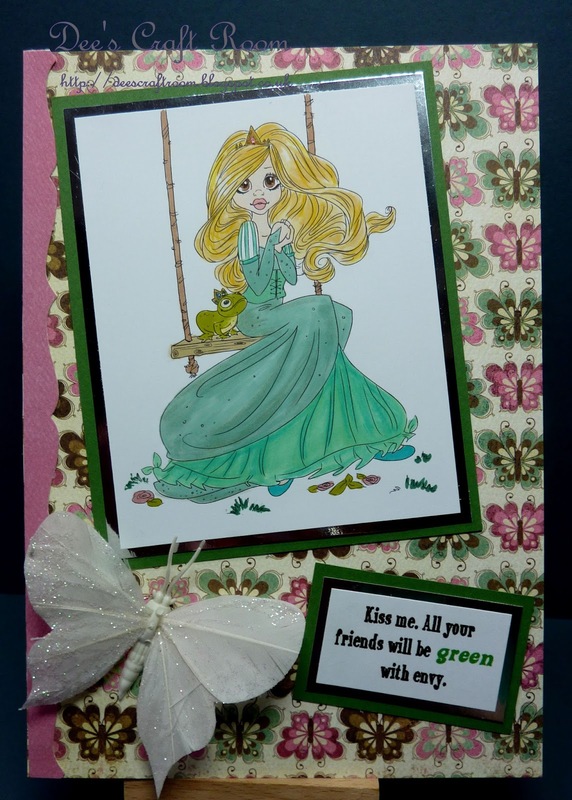 I coloured the image with Promarkers and mounted it on silver mirri and green card. The papers are from Studio Calico and the feather butterfly is from my stash. I wish you could see the butterfly paper, it is coated and when it catches the light it shimmers. The rest of the Crafty Boots Design Team have been busy making some gorgeous cards, do pop by and take a look for yourself. Thank you so much Carol, I look forward to your visits and appreciate your support. Such a lovely card. The image is cute but I love that background with all those butterflies! I don't know if it's the pattern or the colors that have my eyes locked. This is a great card! Thank you. It is a very 'busy' paper, more so than the ones I usually use but I loved the shimmer treatment it has been given. I was given a pack of Studio Calico papers for Christmas last year. They seemed a little 'loud' on first inspection but they have been wonderful and I have loved every card I have used them on. I think they have all gone now (sad face). Thank you so much, you have no idea how much I appreciate your very supportive comments Pamellia. I think Saturated Canary images are really great and they are a treat to colour. It is so sad that they are no more and since they have closed two more of my favourite sites have announced that they are closing down - what is going on?